Project management teams use various tools and techniques to create work schedules and measure the performance of their projects. Project scheduling is one of the most important process which combines time, tasks, resources and costs in a project. Basically work schedules are created by listing the activities, determining activity durations and assigning activity relationships. Gantt Charts, Pert Diagrams and CPM are the most common scheduling techniques used for creating work schedules. One or all of these techniques can be used based on the requirements and the complexity of the project. In this article we will take a glance at the most commom scheduling techniques in project management. A project schedule creates a roadmap for major deliverables of a project. Therefore having a complete and proper project schedule demonstrates you what you have to do in the next period. You can see the relationships of activities, major project milestones that must be achieved under a given deadline. With employing right scheduling methods, you can manage the sequence of activities, tasks and project scope and take actions when needed. By assigning the resources to the schedule, you can also detect the overloads and make resource levelling. Therefore, project schedule management is vital for the success of any project. Gantt Charts are also known as bar charts. Activities are represented as bars and the length of each bar represents the activity duration. The beginning of the bar shows the start date and the end of the bar shows the end date of the activity. Depending on the project execution plan and resource availability, these bars may be sequential, or run in parallel. Gantt Charts are simple tools therefore project management teams and stakeholders can easily understand it and manage their projects by the help of it. Gantt Chart is the most frequently used scheduling technique because of its simplicity. However, without using a software it is difficult to update activities, activity relationships and manage changes as the project progresses. Everybody can create a Gantt Chart and insert activities even by the help of a spreadsheet. 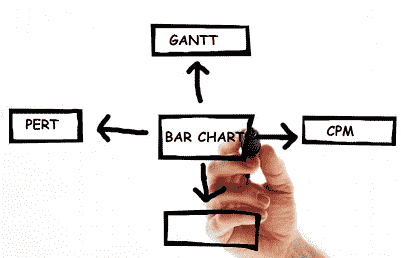 If you don’t know how to create a Gantt Chart, you can read this article from here. The critical path method is an advanced scheduling method which was developed developed in the late 1950s. Then it has been used for the scheduling of any type of projects including construction, aerospace and defense, software development, IT, etc. In this method, activities are linked to each other by using dependencies in a network diagram. These activity groups form paths. The critical path is the longest path of the network diagram. In this method, activities are listed, activity durations are determined, dependencies between the activities are established and the longest path is identified by making forward and backward calculations. The critical path method is a visual technique which enables to show activities, activity dependencies and durations in the same diagram. It is a common method for determining the completion date of a project. However, it is difficult to determine the critical path of a large and complex project without using softwares. Employing softwares like Primavera P6 or Microsoft Project helps to analyze the critical path of a project which includes thousands of activities and relationships. For more details, you can read this article related with the usage of critical path method. PERT Program Evaluation Review Technique was developed by the US Navy in the late 1950’ s for Ballistic Missile Program in order to find a simple system to manage and organize complex objectives and thousands of contractors. In this method, activities are listed, activity durations are determined by using three estimate techniques, dependencies between the activities are established and the longest path is identified by making forward and backward calculations. Simply put, most likely estimate refers to the most possible time required to complete the task. Optimistic Estimate refers to the shortest time required to complete the task. Pessimistic Estimate refers to the longest time required to complete the task. Expected time of the task is calculated by using these three estimates. In PERT Method, project completion time relies on the calculation of the expected duration for each activity. The critical path method is used in conjunction with the PERT Method. You can determine the critical path of the project by performing forward, backward calculations. However PERT is a time consuming method which requires a software to implement. If you want to learn more, you can read this article related with the usage of PERT Method. In this article we discuss the three most common scheduling techniques in project management. Basically, Gantt Charts are the simplest methods used for creating work schedules. However the critical path and the project completion date can not be determined by using simple Gantt Charts. The critical path is determined by identifying the longest stretch of dependent activities within a work schedule. The critical path method demonstrates the project completion date and the activities on the critical path. The PERT method is a complicated method which makes hard to analyze the results. Employing softwares enable to create work schedules, CPM and PERT calculations easier and fastly. What is time scheduling ?